Nanotune, a company from Mountainview, California recently reported that they developed ultracapacitors with energy storage capacity comparable to that of lead-acid batteries (35 Wh/kg). Wh = Watt-hour. Conventional ultracapacitors, otherwise known as supercapacitors or ELDC (Electric Double Layer Capacitors), charge in seconds, do not require replacement when used as batteries, and are able to provide large surges of power in short periods of time without overheating. Their disadvantages include an extremely high capital cost, and a very low energy to weight ratio of 5 Wh/kg (which basically means that ultracapacitors are heavy). To clarify the important difference between cost and price tag of batteries: The long term cost of batteries is not equal to the price tag. The cost of the batteries over a 20-year period for example is 2 x the price tag of the batteries if the batteries last 10 years. Supercapacitors last significantly longer than batteries. So, even though these supercapacitors initially cost $2,400 to $6,000 per kWh of energy storage, and the lithium ion batteries used for electric vehicles initially cost $500 to $1,000 per kWh, in the long term, supercapacitors may be cheaper or comparable. The cost of the supercapacitors after 40 years is $2,400 to $6,000 per kWh if they last that long, and the batteries are actually $2,000 to $4,000 after 40 years if they last an average of 10 years, because they would have to be replaced at least 4 times for every one time that the supercapacitors are replaced. Of course, the supercapacitors would only be cheaper than the batteries if their initial cost is less than $4,000, since that is the maximum cost of the batteries. Nanotune claims that the initial cost of its supercapacitors could decrease to $150 per kWh provided that certain material costs, including the electrolyte, continue to decline. 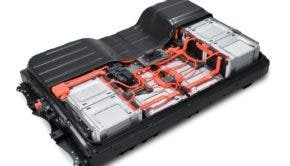 This causes range anxiety, which is a major purchase deterrent for electric vehicles, and it puts a tremendous amount of pressure on manufacturers to maximize range, and this usually involves very large battery packs. Very large battery packs are very expensive. Due to the fact that supercapacitors charge in seconds, fewer of them can be used, and the consequence of that is a shorter range than a battery-powered vehicle, but that is feasible since it is easy and convenient to charge these supercapacitors. Nanotune is making supercapacitors with electrodes that have pores spaced 4 to 5 nanometres apart, but they say that they can make them smaller, which would improves surface. Improving surface area also improves storage capacity. So, this could go a ways towards making supercapacitors more practical and competitive. The Battery That Keeps on Going?